I have two little offerings for the Makin’ Magic theme on GOS this month. I would have had more, but I’m going away, and February will be nearly over when I get back. 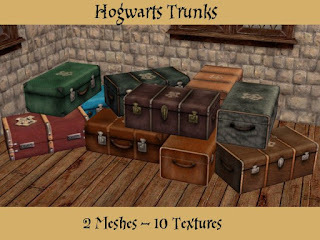 These are converted from the Harry Potter and the Prisoner of Azkaban PC game. There are two meshes, one with one texture and one with nine textures… that’s just how they were, and they’re each mapped differently too! Found in Deco -> Misc. Second, Uniforms for Miss Cackle’s Academy, from The Worst Witch books and TV series. The original TV series ran from 1998 to 2001, and a remake/reboot has just started airing, so I was inspired to make these. There is also a bonus Miss Hardbroom outfit! The Cackle’s uniforms are for CF and TF, TF is pictured. The uniforms consist of a separate top and skirt. The top is a maxis mesh (possibly basegame?) and the skirt is a new mesh consisting on Amaryll’s Bell/Tuula skirt with Yuxi’s Ada Boots- but only for TF, the CF skirt has flats, as I haven’t had time to try a boots version. The skirts come with four different sash colours: Purple, Red, Yellow and Green. The sashes represent the student’s year level (original TV series) or House (books and new TV series). There is also a cardigan, which I forgot to take a picture of, but it’s black with the same shirt collar and tie. The cardigan uses meshes by Skell and Trapping. All Meshes are included. I have also included Miss Hardbroom’s outfit, as seen above. It consists of a top by CatofEvilGenius and a skirt by Trapping. I changed the colour on one of them to match the other, but can’t remember which, so they are both included with their meshes.